The Worm in the Big Apple: Housing Works Troupe SNEAK PEEK from Theatre of the Oppressed NYC on Vimeo. UPCOMING EVENT FROM "THEATRE OF THE OPPRESSED NYC": Theatre of the Oppressed is a participatory theater method started by Augusto Boal in the early 1970s to explore social and political issues, and is now used worldwide. One technique is for actors to play out a scene of a social problem, and then invite members of the audience, as "spect-actors," to step into scenes and replay them with different choices and endings. In this video from last year, Theatre of the Oppressed NYC does this exercise on HIV and housing / homelessness. I bring this up because the troupe has a cool event coming up on Monday, April 15 at Housing Works Bookstore, again dealing with HIV. Another event in mid-May involves LGBTQ youth. Check out the organization's home page for more information. 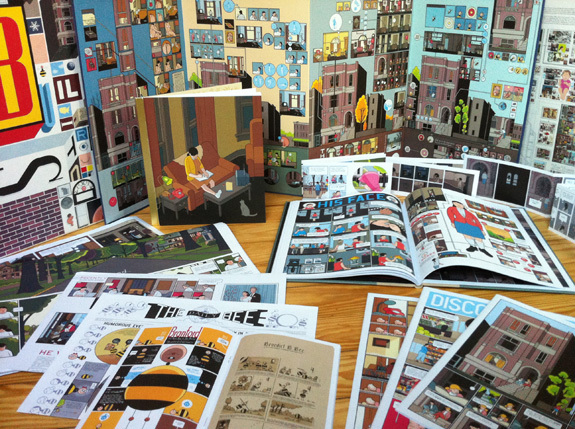 BUILDING STORIES: I recently finished reading graphic novelist Chris Ware's Building Stories, a box set of 14 books, fold-outs, pamphlets and other variously formatted components that together tell the stories of the residents of a three-story Chicago apartment building. The perspectives are various: not only the elderly landlady, the bickering couple, and the lonely woman with an amputated leg, but also the building itself and a bee get the spotlight. The focus is on the amputee, and we visit her at various stages of life. You can dip into her and others' stories at any point, depending on which of the 14 publications you start with, and where you go from there. No matter what path you take, the mysteries deepen or resolve in different ways. You can only read a book for the first time once, but I'm eager to reread Building Stories once I've forgotten some of the details, and shake up the order to see how the story resonates differently. A clever double entendre with the title, as you the reader participate in "building" the stories as you go along. we missed this blog post--thanks for including us! Happy to learn about this blog, as we're definitely firmly in the story-telling world. Hope to continue the conversation. Appreciate it! This is definitely an wonderful webpage!